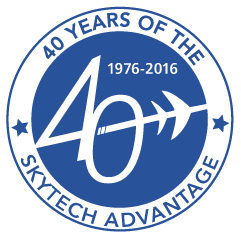 2016 is Skytech's 40th Anniversary! - Skytech Inc.
2016 is Skytech’s 40th Anniversary! 2016 is a special year for us at Skytech. It marks our 40th year in operation and gives us great pleasure in looking back through the years. We’ve seen (and grown) a lot! Look for posts throughout the year highlighting special moments in our past. We thank all of our customers who have made these years so enjoyable and are looking forward to all that the future has in store! Categories: Blog | Tags: 40th anniversary, aircraft parts, aircraft sales, anniversary, fbo services, maintenance, Skytech, and Skytech inc. This entry was posted on Thursday, January 14th, 2016 at 4:52 pm. Both comments and pings are currently closed.